While sub-Saharan Africa had fewer religious restrictions in 2015 than many other parts of the world, it experienced a larger increase that year than any other region, according to a recent Pew Research Center report that tracks these restrictions by both governments and private individuals and groups. Attacks by the Nigeria-based extremist group Boko Haram, along with subsequent government reactions to those incidents, played a role in this increase. Government harassment of religious groups was reported in a total of 37 countries in sub-Saharan Africa (77%) in 2015, increasing from 25 countries (52%) the year before, and was at the highest level recorded for the region since 2007 – the first year for which data are available. Some of the government harassment included bans on religious attire tied to an increase in terrorist activity. For instance, in West Africa, the governments of Cameroon, Chad, Niger and Republic of the Congo banned wearing various forms of Islamic veils in public after Boko Haram suicide bombers used such veils to hide explosives. In other countries, restrictions on the hijab, or headscarf, continued. For example, in Kenya, a high court ruled that banning “Muslim attire” in government schools was constitutional. Government harassment of religious groups went beyond restricting religious dress. In Rwanda, the government detained eight Jehovah’s Witnesses after they refused to take part in community night patrols because their religious beliefs prohibit them from participating in military service or related activities. The government also fired seven Jehovah’s Witnesses for refusing to touch the national flag while taking the public servant’s oath, a practice that members of the group avoid on religious grounds. 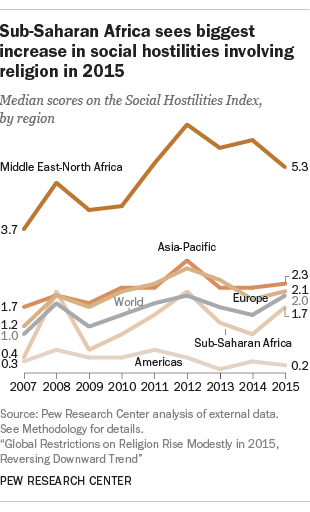 In addition to government-imposed restrictions on religion, sub-Saharan Africa also saw the largest increase in social hostilities by private individuals or groups of any region in the Center’s analysis. The most prominent of these social hostilities involved a spate of suicide bombings by Boko Haram outside its home base of Nigeria. Between July and December 2015 in neighboring Cameroon, for instance, there were 37 reported suicide bombings attributed to Boko Haram. 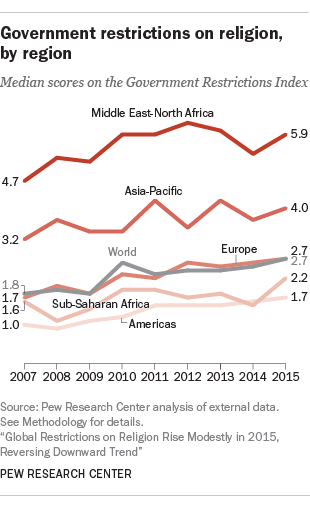 The use of violence, or the threat of violence by private individuals or groups in an attempt to enforce religious norms, also rose sharply in sub-Saharan Africa in 2015. Such actions occurred in 25 countries in the region (52%), up from nine countries (19%) in 2014. These incidents included cases in a number of countries where individuals were suspected of practicing traditional beliefs such as witchcraft and were targeted by people in their communities as a result. In Tanzania, for example, more than 50 people were killed on the basis of their alleged witchcraft beliefs between January and June of 2015. And in the Democratic Republic of the Congo, churches conducted exorcisms of children accused of witchcraft, which involved starvation, beatings and other physical abuse. In some countries the situation was reversed, with people who practiced witchcraft targeting individuals with albinism to use their body parts for witchcraft rituals. In Malawi, a rise in the demand for body parts of people with albinism led to 19 reported cases of abuse, including eight deaths during the year. In Tanzania, several people with albinism were abducted, and there were reports of the death of at least one child early in the year. Samirah Majumdar is a research analyst focusing on religion at Pew Research Center.